of the Unspeakable Oath podcast. 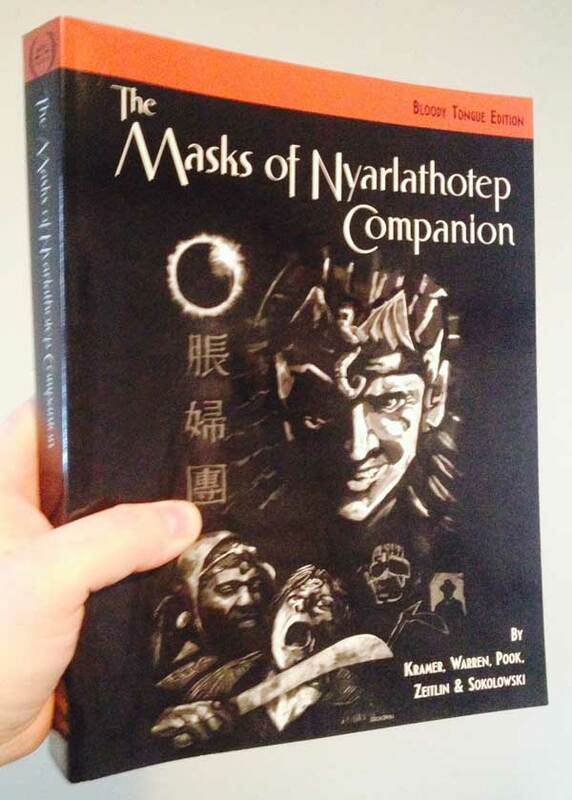 We talked about their respective projects (The Unspeakable Oath #25, Horrors of War, Role-playing Public Radio and other projects), my projects (The Arkham Gazette) and, for most of the show Masks of Nyarlathotep and The Masks of Nyarlathotep Companion. Do give it a listen. It was a lot of fun to chat with the UO crew and hear about their experiences running Masks. I hope I remembered to speak slowly and enunciate. If you haven’t taken a look yet, there are (currently) about 5 days to go in the MoNC Kickstarter. The Unspeakable Oath podcast have released a recording of their second panel – the topic this time is scenarios, specifically creating those for Delta Green, but I think the comments and advice the panel* gives is of use to anyone writing their own material regardless of era or even game system. Tragically the portion of the program dedicated to discuss the genius of my writing was cut off, just before they began discussing them, I heartily encourage you to give it a listen, even if it is just for Ken Hite’s fragmentary tale of a ruined riverboat casino. *Dennis Detwiller, Adam Scott Glancy, Ken Hite, Shane Ivey, and Greg Stotze. A real who’s who of CoC gaming (and beyond). Ken Hite returns on the latest episode of Ken and Robin Talk About Stuff to discuss, with Robin Laws, their experience at GenCon 2014 and, especially, about their various awards. Finally, on a personal note, my print copies of The Unspeakable Oath #24 has finally arrived. Woot! The juggernaut of GenCon continues to roll forward, so there’s a bit more news of late. Don your protective gear of choice and charge in! There’s a new episode of the Good Friends of Jackson Elias – they’re playing R’lyeh Roulette and trying to create a story based on the hook of one randomly chosen spell… no, they didn’t end up with Attract Fish. Like clockwork… or perhaps according to Anunnakkuan programming?… Ken and Robin have again talked about stuff, this time covering tips for writers, the Cathars, and Ken’s new GURPs book – The Madness Dossier. Among the books they’re shilling for (it is on sale!) is Shotguns v. Cthulhu, which includes a story by Adam Scott Glancy based on one of my Shotgun Scenarios. Speaking of thing’s I’ve written, here’s a short new review of Machine Tractor Station Kharkov-37. Turning to Seattle’s most dangerous residents, Pagan Publishing’s Kickstarter for Horrors of War: A Covenant with Death is now two weeks old and only about $2600 from hitting its basic funding (though let’s hope for some stretch goals?). It seems that some are reluctant to join in due to co-author John H. Crowe III’s opposition to offering a digital copy. I’m sympathetic to this – international shipping it truly a diabolic plot of late – but I’m hopeful some solution can be reached. Maybe a PDF only version of just Mr. Glancy’s scenarios? In other news, Golden Goblin Press is having a “we’re not at GenCon sale“. If you don’t have either of their fine scenario collection, this is your chance. Finally, I’ve posted a short update on the Sentinel Hill Press blog covering my reading list of late, sans journal articles which I should probably add. Have a look; I’m hoping we can work out the licensing issue shortly after GenCon. Maybe? Feel free to talk up the Arkham Gazette at the Chaosium booth, eh? I guess we’re entering the pre-GenCon roller-coaster of news and new releases! First off, there’s a new episode of the Unspeakable Oath Podcast. Regular host Ross Payton, Shane Ivey, and Adam Scott Glancy, are joined by their guest Ryan Macklin (no relation). Of particular interest is the possibility that there will be a Delta Green preview at GenCon and details about the pending Kickstarter for Horrors of War. My MKULTRA programming of Adam Scott Glancy continues to pay dividends as well. Mwahahahahah! There’s also a new episode of the Miskatonic University Podcast; this time they’re talking about the Ripley Scrolls, the Voynich Manuscript, and their namesake, Miskatonic University. RIPPLES FROM CARCOSA expands upon the mythology of “He Who Should Not Be Named” and gathers much of the varied material on Hastur into one place. The first chapter reviews The Great Old One Hastur and his various avatar forms. It examines the Yellow Sign, the play “The King in Yellow”, the Mythos tome of the same name, and the effects these things have on the human mind. Next within these pages is a trio of adventures pitting investigators against Hastur and his human worshippers. These scenarios can be played as stand-alone adventures or as a linked campaign called “Ripples from Carcosa.” Investigators are provided for each scenario, but keepers should feel free to allow their players to use their own investigators if they so choose. Cubicle 7 have announced they are now taking pre-orders for the next book in their World War Cthulhu series – Europe Ablaze. The PDF is available now. Role-Playing Public Radio have begun posting their live play of the ENnie nominated The Sense of the Sleight-of-Hand Man. Here are episodes 1 – 2 – 3. Finally, Feed the Shoggoth‘s Kickstarter has wrapped up, hitting c. $15,000. Congratulations Badger! A long (long long) interview with Adam Scott Glancy and a not quite as long (but still substantial) interview with Kenneth Hite. The Good Friends of Jackson Elias, slowing their pace down, talked about combat in 7th Ed. Call of Cthulhu and their favorite ‘weird’ movies. Finally, the second part of the new Plot Points podcast’s discussion of Convergence is also out. Secrets of Tibet is now available in print and Dead Lights as a PDF. If you have two grand (or were part of the Kickstarter) you can have a look at the proof of Horror on the Orient Express. The Unspeakable Oath released the subscriber rewards – fiction from Adam Scott Glancy and John Tynes. Oscar Rios has announced that the Kickstarter for Golden Goblin Press’ next book “Tales of the Crescent City” will start on January 24th. And I tied for second in the most recent Shotgun Scenario contest on the Delta Green Mailing List. There may be more, but I can’t think of it right now. By great Nodens beard I’m beat, but, dear reader, I feel obliged to start my year-end wrap up before 2014 is too long in the tooth. First off, I want to thank every one for the kind words regarding Oliver, on and off-line. Secondly, in looking back at the past year in Lovecraftian gaming, I realize how much of it I haven’t had either the time or inclination to read. This is, in a way, a good thing, since it suggests just how much material was produced for Call of Cthulhu and related systems. I hope no one is too put out that I am not going to give a comprehensive review to every release. I’ve written for the Unspeakable Oath, so I’m far from unbiased, but I look forward to every issue. The Oath put out two issues this year, which is a pretty good pace. Hopefully now that they’ve had a successful subscription drive they’ll have the resources to do even more in the future. My only criticism is that, as much as I liked “Cold Dead Hand”, Adam Scott Glancy’s Soviet scenario in issue #23, I would rather it have been a stand-alone publication rather than 75% of one issue of the magazine. I want more Oath. I realized yesterday that I hadn’t actually finished reading the campaign (I got distracted around page 200), so I can’t say I’ve read the whole thing, BUT I think this is a great book. It’s a unique campaign, only the second ever set in the Dreamlands (after Kevin Ross’ neglected “The Dreaming Stone”). It is a fresh approach to the setting that I think should disabuse Dreamlands detractors of their disdain. It can seem a little railroaded, but I think most players will enjoy the ride so much, they won’t notice. It was nice to finally see this in print. Not essential, but an enjoyable addition to my collection, especially useful to those running games set in the UK or using Celtic myths and legends. Confession time… I haven’t read this and I’m not likely to pick it up any time soon. WWII just isn’t a gaming setting that piques my interest. It sounds as if the Cubicle 7 version is less pulpy than Modiphius’ Achtung! Cthulhu, but if I’m using the War, I think I’d go even darker. Last for today, but most certainly not least, is Golden Goblin Press’ first foray. A really solid scenario collection with a couple outstanding pieces, Island of Ignorance is an impressive debut from this fledgling publisher. My own tastes would have replaced the supplemental articles with scenarios but I respect Oscar Rios’ desire to emulate the CoC Companions of old. GGP also ran the best Kickstarter I’ve yet seen – on time and with very open lines of communication. Let’s hope they keep up the good work, which I very much think they will. I forgot to mention Adam Scott Glancy was interviewed on Role Playing Public Radio wherein he talks about the role research plays in scenario writing. Sorry! The Delta Green Mailing List has held its annual Shotgun Scenario contest and are voting to pick the winner. Cubicle 7’s London Box Set’s Kickstarter wrapped up at 600% of its funding target. Did I mention Secrets of Tibet has been released, at least as a PDF? 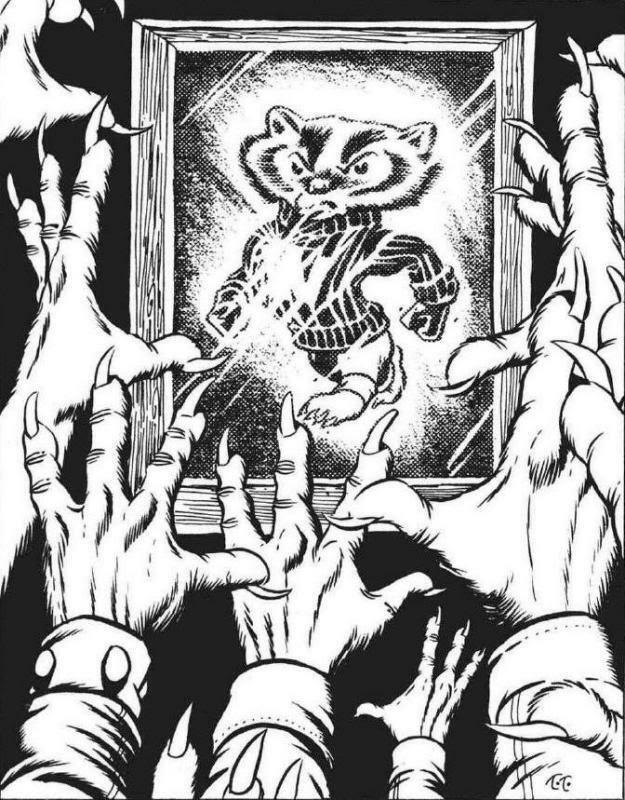 We’re still looking for submissions for the next issue of the Arkham Gazette, as is Protodimension Magazine.